YGD Travel Agency have been operating here in the Philippines for more than 3 years now, acquiring vast knowledge and tools that enable us to provide the most professional service. During those years, we have had multiple successful partnerships with international agencies and corporations. These trips include wedding and family re-unions, organized groups vacations, Overseas incentive trips for companies and many more. Our services are extremely flexible and we can help you with building the perfect itinerary for your clients. We provide a one stop solution and promise to work hand in hand with you to make sure all your wishes are met. When you work with us, we treat your clients as our guests and take full responsibility for their well-being and enjoyment. The Philippines is one of the biggest emerging tourist destinations. The islands here are consistently chosen as the best in the world by high profile magazines and sites such as Travel & Leisure, Condé Nast, TripAdvisor, Lonely Planet and many more. The Philippines have also been the most featured destination on the American TV show ‘Survivor’ (tied with Samoa) and has generally enjoyed significant positive exposure in mainstream media. Our country is the perfect choice for travel agencies and companies who wish to offer a wider, more unique portfolio to potential clients. It offers a perfect combination of culture, nature and adventure and at much more reasonable prices than more developed locations such as Thailand or Cambodia. The emphasis here in the Philippines is on activities and adventures, mostly water-based, which are really the best in the world. Another major selling point is the fact the Philippines has more than 7000 different islands on offer. With so many to choose from, it is very easy to plan an itinerary which will completely match your client’s needs. No matter where you are from, how old or what you like doing, you are certain to find a suitable destination here in the Philippines. Ultimately, a vacation in the Philippines is all about a balance between relaxing at white sands beaches and world class resorts, and going out on exciting day tours and excursions to the most breathtaking locations in the world. It is a chance for visitors to truly feel like explorers as they make their way through the jungles into hidden private beaches. When they get back home, they’ll have a real story to tell, which will get all their friends and family itching to book a trip of their own. Despite all of its wonderful advantages, the Philippines offers one major challenge to both tourists and travel professional alike. It is still an underdeveloped country, which is part of its charm, but also means it can be quite unpredictable at times. Delays and even cancellations are a common sight, and without proper preparation and immediate response these can easily mess up what was otherwise a tightly planned itinerary. We understand the need to provide clients with a professional and accurate service and are very experienced at finding on-the-spot solutions. When you partner with us, your reputation is just as important to us as our own. So, right from the stage of planning the trip we will make sure we offer your clients a product which is sustainable and realistic, to minimize the chance of possible disappointments later on. These challenges become even more relevant while dealing with large groups, which is our specialty. Our biggest strength lies in our ability to customize the services we offer and provide 100% personal service throughout the trip. We pride ourselves at being a boutique agency that gives that added touch to each trip we organize, and your guests will be treated in exactly the same way. We are always responsive and keep an open mind for changes and special requests, as well as provide instant solutions for unexpected requests and emergencies. When it comes to customization – the sky is the limit. As long as we plan well in advance, pretty much anything your clients want is doable. We are committed to providing that added value to our partners, and are already well known for our innovation in organizing custom tours and events that were never done before, while executing them at the most professional manner imaginable. YGD Travel agency is committed to provide its partners with a one-stop solution to address all their needs. You will have a reliable local partner that will help the trip run smoothly and take care of everything from A to Z. As we are always on the lookout for lasting, long term partnership, communication and responsiveness are important to us. All you have to do now is mail or call us, and we can start speaking about how your travel packages should look like. Our most recent corporate vacation was for a group of 35 employees of Cellcom – the largest mobile provider in Israel. 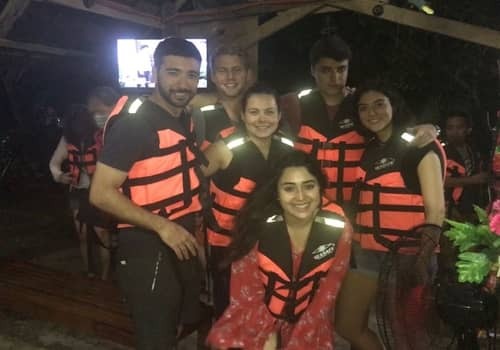 This incentive trip was organized through a local travel agency in Israel, who teamed up with us to deliver a once in a lifetime experience. 4 star accommodation at a beachfront resort, chosen by the guests themselves based on our recommendations. All meals included, with special lunch settings in different restaurants each day. This included special delivery of Kosher food from Cebu. Branded flags, napkins, table clothes, welcome package at hotel with a personal note to each guest and much more… All prepared especially by us and included Cellcom’s logo. Prepared in Manila and flown to Bohol. We use each of these trips to perfect our service and be able to offer better solutions to our partners. 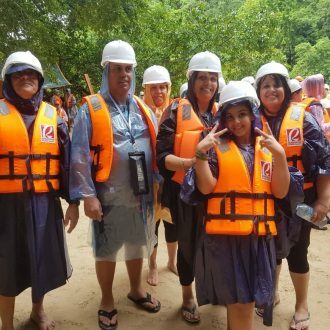 Our experience with handling large groups comes into play and let you provide your clients with a unique, once in a lifetime adventure. We’ll be there to support you all throughout the trip and ensure you are able to provide such an experience to all of your guests. We will keep updating this page with our latest bookings so stay tuned for more fantastic experiences to come. For more information, please visit our about us page or read more testimonials and travel stories by our guests. We look forward to hearing from you by phone or mail, and hopefully establishing a long lasting and successful partnership.